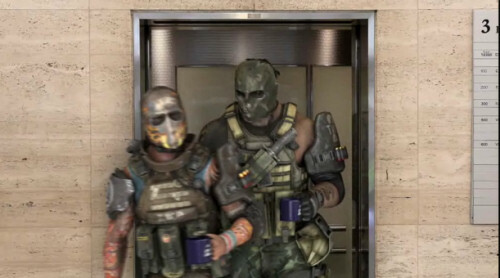 Co-Optimus - News - Army of Two: The 40th Day "Pushes Co-Op Design Forward"
The original Army of Two did a lot right as far as co-op is concerned. All signs point to this trend continuing in the sequel, Army of Two: The 40th Day. In fact, according to Kotaku, The 40th Day compares very favorably to other co-op all-stars such as Gears of War and Resident Evil 5. Their hands on preview is definitely worth a read, particularly these snippets about innovations in co-op. But what about transcending its predecessor and those games it can be compared to? That's where Army of Two: The 40th Day shows promise. I played the first chapter both by myself and with a partner. I played the second on my own. In any configuration I felt both the relevance of having a co-op character at my side and a sustained interest in how that could make conventional situations play out in more interesting ways. The designers of the game have smartly presented a varied sequence of co-op opportunities. More interesting than the presence of a wall which the two characters need to help each other surmount are the occasional run-ins with enemies who have taken hostages and other sudden instances that are best sorted out not by one man but by two. What is evident after playing almost two hours of this is that the level design and the things that can be done within the game's levels are not just memorable but open to player ingenuity. It seems clear that the designers have gotten better, that this sequel is an improvement. What's also clear, however, is that a human ally is best. We're smarter than an artificial intelligence character would be. And, more alarming, we're way smarter than the enemies. If Army of Two: The 40th Day has a weakness, it's that its enemies are still quite stupid. Some stand around unaffected by combat, unmotivated to join the fight. Some walk right into our traps. They're not crafty, not as crafty as us. The game compensates by sending hordes rushing in. And against those hordes there is plenty of opportunity for strategy. It's fun to take them out. And, well, it's been fun to play this game. Is it January 12 yet?